In early April, a wonderful thing happened. We received an email from Sean Kelly, a teacher at the Fudan International School in Shanghai, explaining that he was planning a Walk for Water with his elementary students in order to donate funds to Amman Imman. We were excited by his email, and, of course, we were happy to provide any assistance necessary to help them raise money for the people of the Azawak. Sean kept us informed about the many interesting fundraisers that the children and their parents participated in, such as a rummage sale, a raffle, a water balloon toss, a pie walk, a limbo, and a slippery melon race (where students and parents did a relay with a watermelon covered in oil). There was even an activity called “slime the teacher,” where children voted with tickets on a teacher they wished to slime, in true Nickelodeon fashion! 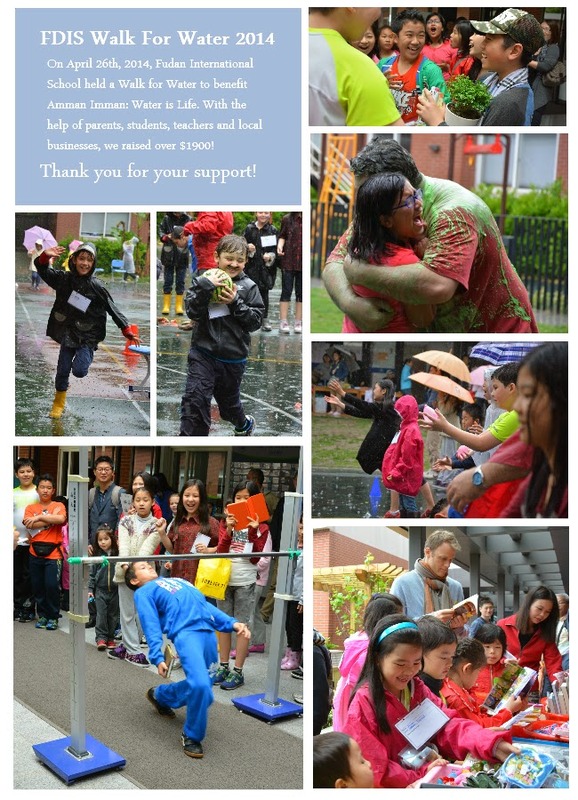 Through all of these fun activities, Sean Kelly and the Fudan International School elementary students raised $1,945 during their Walk for Water, even though it rained the whole time! The care and perseverance that the children and their parents demonstrated by sticking it out through the bad weather is astounding. Perhaps they knew that they were blessed to have a little bit of rain as opposed to no water at all. The Walk for Water held by FIS was a huge success, and what’s more is that it has confirmed that our mission at Amman Imman reaches beyond our own borders here in the United States and that of the Azawak region. At the Fudan International School, its students are encouraged to be global citizens -- students who desire to help and change the world both locally and globally. It seems that, with the help of Sean Kelly and Amman Imman, these students are learning about the struggles and cultural differences of their brothers and sisters on different continents, and truly want to make a change for the better. The money raised by the Fudan International School will help Amman Imman in its mission to bring water, food, and economic stability through multiple strategies to the people of West Africa. of the Fudan International School! and will help us make a difference!